so, todays post is a mini one as I just wanted to share my latest purchase. before I dive into my annual winter coat hunt (yes I'm determined to find 'the one' this year) I wanted to get myself some boots. my main requirements this season is block heels and texture- either snake effect or 70's suede. I'm super pleased block heels are back, as let's face it I'm pretty lazy so it takes a comfy heel to drag me away from trainers. 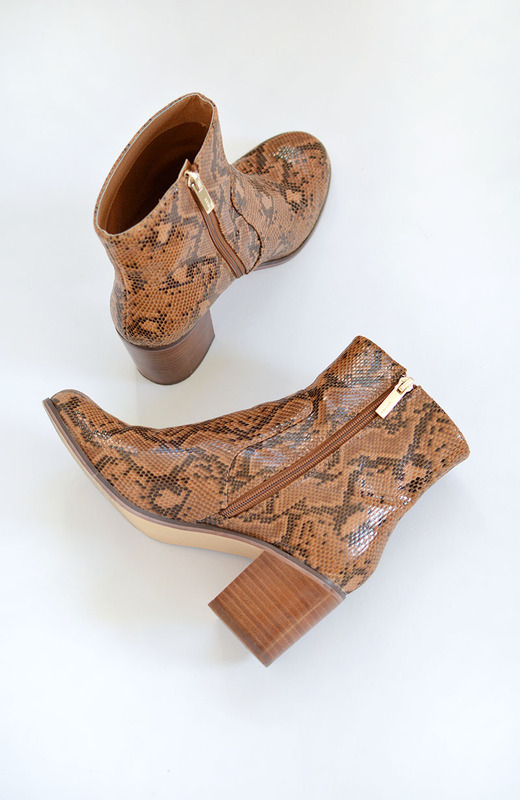 I did a little dance when I found these topshop boots as they're a great dupe of the KG ones and a fraction of the price.. they're nearly out of stock online but definitely worth keeping an eye out for. the green version is still available and I've linked all my favourite 70's inspired high street footwear below if any of you are a-hunting for some too.. Au these are perfection in a boot! Block heels are the best, and these boots are lovely! Can't wait to see you style these!